One of the Red rooms of the New Uffizi - the room 61 - is dedicated to Jacopo Pontormo (1494-1557). Pontormo is a great artist of the 16th century, a pupil of Andrea del Sarto, who worked mainly in Florence. Pontormo was a friend of Rosso Fiorentino - another pupil of Andrea del Sarto - and he was the master and lover of Bronzino, another star of the Uffizi Gallery. Pontormo is known for his introverted and complex personality, which makes him the prototype of the complicated and introverted artist. His art was courageous and innovative: he was able to create his own style, and to break the traditional mold. Pontormo studied the great Italian artists such as Andrea del Sarto, Michelangelo and Leonardo, but he reworked the 15th century art and he created an original language. In the past, his art was judged excessive and bizarre, for example by Vasari. Pontormo was paying his \'anticlassicismo\'. His works are distinguished by the original use of bright colors, for the study of the human figure, which aims to overcome the mastery of Michelangelo. However, even the work of Albrecht Dürer and Lucas van Leyden had a significant influence on Pontormo. 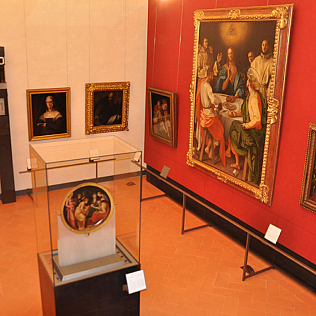 Which works are exposed in room 61 of the Uffizi? The large canvas depicting the Supper at Emmaus. In this painting the artist represented the crucial moment of the revelation of Jesus to his disciples and created a work that influenced other great artists, such as Caravaggio and Velázquez. The Expulsion of Adam and Eve, that represents masterfully the remorse and suffering of the two human beings, while they are punished. The Nativity of St. John, a table for childbirth. The painting was realized with the use of a convex mirror, to deform the real figures. Also present: the famous portrait of Cosimo the Elder, the portrait of Maria Salviati, a St. Anthony Abbot and other works.